Archie, a snarky genderqueer artist, is tired of people not understanding gender neutral pronouns. Tristan, a cisgender dude, is looking for an easy way to introduce gender neutral pronouns to his increasingly diverse workplace. 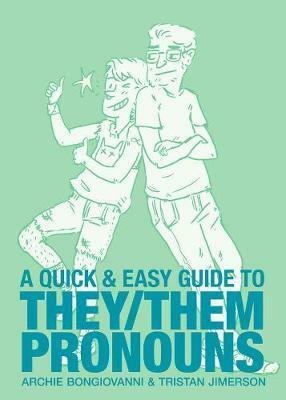 The longtime best friends team up in this short and fun comic guide that explains what pronouns are, why they matter, and how to use them. They also include what to do if you make a mistake, and some tips-and-tricks for those who identify outside of the binary to keep themselves safe in this binary-centric world.